Thursday morning, October 13, 2016, Mrs. Jaime’s 8th graders were measuring almost any circular object – clocks, trashcans, paper plates, S0l0 cups, etc. The students were given the task to record the circumference and diameter of three circles. Some items measured were so large that students needed partners to hold the measuring tape, some items were best measured by using a piece of string to get the size and then measuring the string, and some items could be measured easily by an individual. The students recorded the measurements in personal charts and then added those personal notes to the class chart on the Smartboard. By dividing the circumference of each circle by its diameter, students will discover the same value regardless of the radius. This is the mathematical constant Pi (3.14). Thanks for attending OPEN HOUSE 2016! It was great to see our hallways filled with students and parents. On April 22, 2016, the University of Central Arkansas (UCA) hosted the fourth annual Girls in STEM (GIS) conference for junior high girls in Arkansas. Each school was allowed to bring ten eighth grade girls. Attendees from Woodlawn were Madison Barringer, Caitlyn Courtney, Fathe Davis, Olivia Gavin, Kaitlyn Norton, Ruth Poplin, Reagan Simmons, Makenzie Thrower, Alaina Wilcox, and Jayne Williams; Mrs. Jaime Hunter and Mrs. Michelle Mercer were the chaperones for the trip. The “hub” of the conference was the Farris Center on UCA’s campus, but the girls were able to visit several building and other areas on campus to go to their assigned classes. Each schools’ group of girls was divided, making up several teams. Team leaders were UCA students and recent graduates studying and/or working in a STEM field. throughout the day the teams moved throughout several classes hosted by women from across Arkansas working in the STEM field. The class instructors were doctors, scientists, pharmacists, IT people, etc. The keynote speaker for the conference was Dianna Cowern. Dianna is the creator of Physics Girl and has a website and YouTube Channel by that name. The WHS girls who attended the conference each wrote a short paragraph to summarize what they did while at the conference. Going to the STEM Convention was unbelievable. Throughout the day, we scouted out classrooms and outside spaces. We had groups and team inspirations. The team inspirations were people who inspired STEM. I had been assigned to the Rosiland Franklin group. She was a famous chemist, one of the smartest at that. We got to meet the people who worked for big companies that impacted our life from a day to day basis. I got to meet Claire J. Deroshers. The lady that was speaking was Camille Coston, she works as an IT support for the Electrical Transmission Grid. We learned that they help keep our power on, we did an activity that showed us how they work the Electrical Transmission Grid. It was interesting to see how they know when to turn on and off the gas and coal when it goes over zero. They turn it off when it goes over zero. This session was with Kandace Farle. This session to me was by far the most fun. We learned how to make an app and we even drew out designs to our own app, in my group our app name was Good Vibes, Good Vibes is an app for teens. The app makes people feel better about themselves, and it doesn’t let anyone say anything mean. I really liked the app because there could not be any bullying. This session was definitely my favorite. In Astronomy, we learned about all the different kinds of constellations, galaxies, and how stars were made. This session was taught by Dr. Debra Burris, who has a PhD in Astrophysics. She shared with us a few stories of how the Greek Romans believe stars were named. Going into the session, I didn’t think I was going to like it, but I really enjoyed seeing all the different things she showed us. At the end, she even let us make a constellation viewer for us to keep. One session that I went to was taught by Sharon Hawkins. She is a GIS administrator. She spoke to us about how to make data make sense. We talked about database design and mapping. She also shared with us roadways and how to get around using signs. She told us that they have truck with cameras and stuff all around it that allows them to see the roadways conditions without actually having to get out and check. The cameras take pictures of the roads for them. I thought that was pretty neat. In the trauma session, Mary Katherine Kimbrough was the teacher. She works at UAMS in Little Rock where she takes care of patients who come in with an emergency, such as fatal car crash accidents and near-death experiences. She used to live in Louisiana and moved to Arkansas to pursue her career. Kristie Coley, is a Director of the Veterinary Technology Program at the Arkansas State University-Beebe. She told us about what she does for a living. She told us some interesting stories that she has experienced as a vet. She also told us what she teaches at the ASU/Beebe and what she likes about it. Then, she asked us about what we want to do when we grow up and asked us if any of us are interested in being a vet. Whitney Tidwell has a degree in physics, a mainly male dominated subject. She thought it was important to teach us that girls are able to do anything boys can do. Also, how to pay a little attention to detail. She gave us itty bitty pieces of paper, a microscope, and let us loose. We were free to draw whatever our little hearts desired. As we were drawing with a variety of utensils. She taught me the importance of looking a little bit closer, closer than everyone else would think to. The end product would be beautiful. At the Stem field trip to UCA what I recall as a very kind lady, Ashlen Thomason. She is a speech- language pathologist from Arkansas Children’s Hospital. She told us about different disorders and how some foods can be mixed with cornstarch to make foods easier for children with swallowing problems to eat. The cornstarch makes liquids more solid therefore easier to eat. Nickie Owens, rt teacher, submitted the artwork of 12 Woodlawn students for the 55th Young Arkansas Artists (YAA) Exhibition. Submissions could be from any K-12 public, private, or home school art teacher or instructor across the state. Requirements for submission included that the art had to be original and created during the 2015-16 school year. The exhibit is part of the Arkansas Arts Center. The art center’s website explains that “works in a huge variety of media are juried by a professional panel and a chief juror selects a “Best of Class” and two “Honorable Mentions” for each grade.” These selected piece will travel to schools and venues across the state. More information about the exhibit can be found on the Arkansas Arts Center website. Mrs. Nickie is proud to announce that the work of 9th grader and Art I student, Madelyn Swinney, has been chosen to be a part of the YAA exhibition. Madelyn will attend the 55th YAA Awards Ceremony and Family Festival on May 7, 2016. Her art will be displayed in the exhibition May 6, 2016 -July 24, 2016. This year’s grand juror was Tim Clifton, Professor of Illustration and Drawing and Art Department Chair at the University of Arkansas Little Rock. 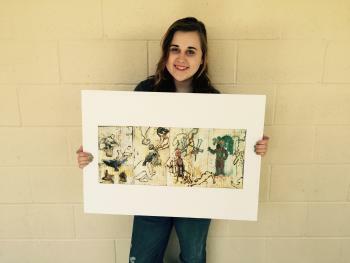 Madelynn’s art was selected as one of the two “Honorable Mentions” for ninth graders across the state. Congratulations Madelynn and Mrs. Nickie! Woodlawn EAST students Tyler Gavin (right) and Matt Conner (left) explain projects to a crowd gathered in front of the Bears' booth. EAST took eight students to the three-day EAST Conference in Hot Springs recently. Students who attended were: Mercedes Johnson, Madison Morrison, Katie Willett, Jade Holleman, Easton Mullinax, Gage Ball, Gavin and Conner. 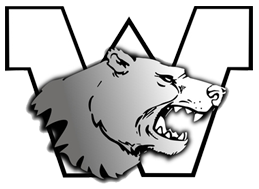 You can learn more about the EAST conference by reading the EAST Conference Newsletter in the Extra-Curricular section of our website or by following this link.